Home » Lotions and Creams » What Does Dimethicone Change in a Lotion? I was looking at lotion labels the other day, and I noticed that all of my favorite lotions contain dimethicone. I wondered how much this ingredient impacted my preference for those lotions. Come along while I try an experiment as I’ll make two lotions using a simple recipe. One lotion will contain dimethicone, and the other will not. 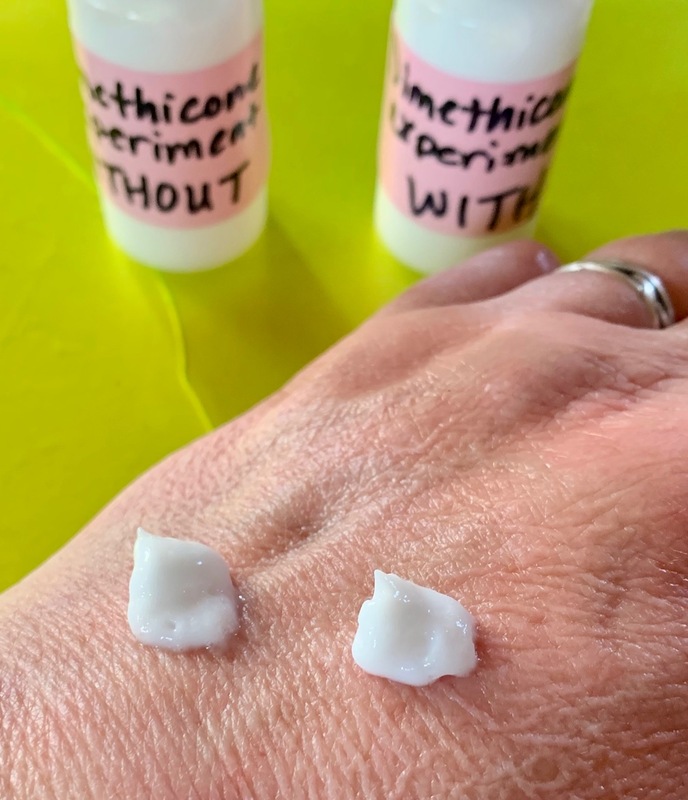 You can see by this image that there isn’t much difference in the viscosity and texture of the two lotions. My experience with lotions containing dimethicone is that they leave my skin feeling moisturized longer than lotions that do not contain it. I had to find out if dimethicone made that much difference! You are probably wondering what dimethicone can do for you. Check this list out! I chose to use only Apricot Kernel Oil because it is a light, non-greasy oil. The color is pale, and it does not have a strong aroma to compete with any fragrance you may choose to use. Glycerin as a humectant is not the longest-lasting, which is suitable for my purposes. I opted to use Berries & Twigs Fragrance at a light amount. I really like the berry smell that isn’t overly sweet in this fragrance. and subtract that amount from the Apricot Kernel Oil. Weigh all the ingredients but the preservative and fragrance into a microwave-safe container, and heat in short bursts until the ingredients have melted. Stir well to combine, then set aside the mixture until it cools to below 120º F. At that time, add the preservative and fragrance. I made my two batches and bottled each, making sure I didn’t get mixed up. I’ve been testing them for a couple of days, using one lotion or the other several times a day and noting how my skin felt. I’ve used both lotions after hand-washing dishes, after washing my hands, before bed, and numerous times when my hands just felt dry. I also used each on my whole body after showering. The lotion with dimethicone definitely outlasted the version without it. Both lotions are very light feeling, which I expected with the Apricot Kernel Oil. In applying both lotions, the version without dimethicone seems to take a bit longer to rub in, and it leaves more of an oily sheen on my skin. I noted that the dimethicone version did seem to have more glide as I rubbed it in. But most of all, it seems to me that the dimethicone really helps the staying power of the moisturizer. I was surprised by the results of my little experiment. I never thought one ingredient could make such a difference. Have you ever tried an experiment like this? What did you discover?